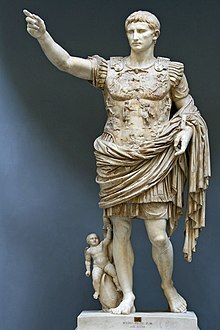 Augustus (Latin: Imperator Caesar Dīvī Fīlius Augustus; 23 September 63 BC – 19 August 14 AD) was the first Roman Emperor, ruling from 27 BC until his death in AD 14. He led Rome in its transition from the Roman Republic to the Roman Empire. The triumvirate broke up in 33 BC, and disagreement turned to civil war in 31 BC. Antony was defeated by Octavian at the naval Battle of Actium and then at Alexandria. He committed suicide, as did his lover, Cleopatra VII of Egypt, in 30 BC. Lepidus was sidelined, blamed for a revolt in Sicily, and removed from government. He died peacefully in exile in Circeii in Italy in the year 13 BC. After winning the power struggle, Octavian was voted as Emperor by the Roman Senate in 31 BC. He took the name "Augustus" (which meant 'exalted'). He ruled until AD 14, when his stepson and son-in-law Tiberius became Emperor in his place. ↑ Robinson Jr., C.A. (1964). "Introduction". Selections from Greek and Roman historians. Holt, Rinehart and Winston. pp. xxix. Wikimedia Commons has media related to Augustus. This page was last changed on 10 April 2019, at 10:41.